As a business or homeowner, you are likely aware of the condition of your structure. Daily inspections may help to keep you abreast of all of the concerns of elements such as your roof, but over time, these systems can become worn down and less effective at keeping the home protected. If you are in need of roofing installation services and your roof has relatively flat slopes, it’s important to find a system that delivers proven protection against moisture and the elements. One material that many homeowners likely haven’t heard of is ethylene propylene diene terpolymer (EPDM) or rubber roofing. This synthetic material, when installed by a professional roofing company, can provide long-term benefits that keep your building safe and sound for years to come. 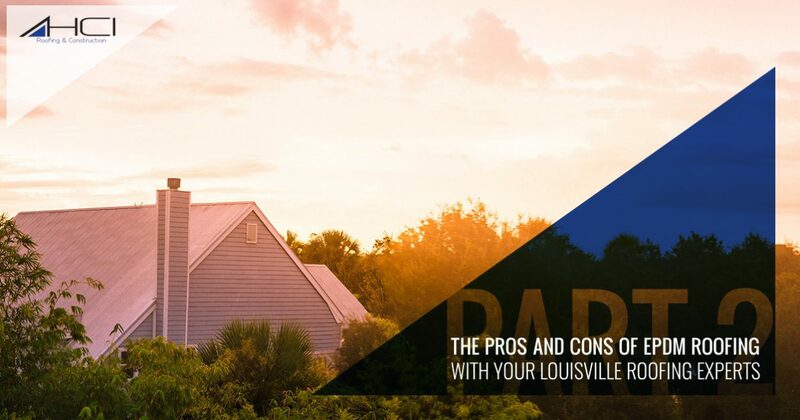 As your Top Rated Local® Louisville roofing contractors, HCI Roofing and Construction is here to provide the best services to keep your property in optimal shape. We’re dedicated to providing the best results with honest, affordable, reliable services. Today, we’ll continue to highlight a few of the benefits of rubber roofing and whether or not it may be right for your Kentucky home. If you’re in need of roofing repairs or replacement, be sure to contact our experts today! Replacing your roof is one of the biggest investments you can make in your property outside of the actual home purchase. When you need a new roof, it’s important to find a material that is built to last. EPDM roofing is made to withstand the worst weather, presenting a high tensile strength to perform to the highest ability for years to come. This material is very resistant to punctures, cracks, tears, and more, delivering like-new performance after 30 years, according to a study by the EPDM Roofing Association. Rubber is installed on your home in as few pieces as possible, eliminating seams to provide superior protection from moisture. Modern advancements have also increased the protection against sun damages, hail, and more. Under the right conditions, your EPDM system can last more than half a century. Rubber roofs are glued and mechanically fastened, creating an airtight bond to your building for amazing temperature retention while reflecting a lot of heat. Based on where you reside, different types of EPDM roofing materials are available to help retain the most energy for your building. Rubber is great for insulation, and when you increase the amount of insulation underneath, your structure can benefit from additional insulatory advantages. EPDM is also eco-friendly, as less energy is required to produce this roofing material. Much of your rubber roof will come from recycled materials, and when your EPDM roof is finally retired, it can be fully recycled for a new purpose. If you have a low-slope roof, it can pay to reach out to our Kentucky roofing contractors for assistance. EPDM roofing can be an amazing product, but only when it is installed properly. For years, our local roofing company has worked hard to deliver the best services to create the best outcomes for each of our clients. If you’re in need of Louisville roofing experts, be sure to contact us today for a quote!